Typical shape of members of the kelp crab family. Species in this family are usually from 5 to 9 cm across the carapace. This week I bring you the “Where’s Waldo?” of the marine invertebrates. There is a decorator crab in each of the images at the link below. But first, here are some clues for you. 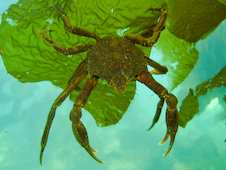 Most of the species of crabs that decorate themselves to be masters of camouflage are in the spider crab family (Majidae family – also known as “kelp crabs”). The image to the right shows you an undecorated kelp crab with the typical long legs and distinctly shaped shell (“carapace”) of this family. Some crabs only partially camouflage themselves, especially when they are juveniles. Others “plant” so many marine neighbours onto themselves that you can’t tell them apart from their environment until they move. Although they look like walking gardens, the organisms they attach to the stiff, curved hairs on their legs and backs are algae and animals, not plants. The animals can be soft corals, sponges or unique creatures like “bryozoans” and “hydroids”. Not only does this covering of life allow the crabs to hide from predators, it also changes the way the crabs feel and taste. For example, sponges taste bad or are even toxic to many predators so, if you cover yourself with sponges, predators be gone! The bonus of carrying other organisms on your back is that you also have a food supply within a pincher’s reach. It is truly astounding how well the decorator crabs match their immediate surroundings which added another mystery to my list: Is the range of decorator crabs really small so that they always match their background OR do they know to “adjust” their camouflage when they move to an area where they no longer blend in? I have learned that the latter appears to be the case. Experiments with captive decorator crabs have shown that, if moved to a background that no longer offers camouflage, the crabs will “adjust” their decorations! Click here to find the decorator crabs in my images or view gallery below. I loved “Find the Crab”! Those pictures are amazing. I have to be honest, I had a hard time finding the crab in a couple of photos. Our class is going to play camoflage this afternoon. Thanks for the inspiration! Made my day Sean – to know that, especially with your passion for environmental and outdoor education, the ripple effect is alive and well! With this kind of encouragement, books will be coming! Will likely do a feature on “find the fish” as well. See you soon. Jackie, when the crabs moult, do you think they remove the creatures from their old shells and put them on their new bodies? Great that you asked! Yes, apparently at least sometimes, when the crabs crawl out of the backs of their shell in order to grow a new one with room to grow, they transplant the growths on their old shell. I should do a blog on moult in crabs. For 80 yrs. I’ve drifted along in my rowboat w/my head hanging over the side. I have seen many wonderful sights. Living on Day Is., the Narrows brought everything past me. The kelp crab has been to me, a beautiful creature. An octopus drifting under the road-bed of the 1st Narrows bridge (with faint traces of the yellow line) was beautiful. Thank you for your blog. I wish I’d had a camera. Thank you so much Anika! Really helps to know these efforts are reaching an audience and fuelling oceans awareness / action. jackie dont think im stealing your thunder but im the next marine dective! your amazing!!! I don’t think the world can have enough Marine Detectives so go for it! I know that you realize that what being a MD is all about is getting people to care about the environment and make a positive difference!! Okay, you guys are totally making my day. Please let all the class members know how happy I am that you guys are using the website. The most humpbacks I have ever seen together IN OUR AREA, is 4 associating with one another. They don’t stay with one another long though. It’s very different in areas where they bubble-net (a bit further up north) and in the breeding grounds like Hawaii. There you get bigger groups. A humpback, as is the case with marine mammals, can only have one baby at a time. She takes care of it for a year and usually, therefore, they have a calf every 2 to 3 years. We have one super female that has been in our area though who had 5 babies in 7 years. I will be writing about her in the future. So, usually only 1 baby every two years or more. I will make it even more challenging in the future with “Find the Fish”! So wonderful that you are using the website. I loved whale watching with you all Michael! Well thanks for a good Whale watchin trip Ooh and about how i high do dolphins jump? Pacific white-sided dolphins (the species we saw together) can jump up to about 5 m. I have only ocassionally seen them jump about this high but yes they can jump high!!! Hi again jakie when are you goin to put the pictures of the whale watchuing triip? I sent the pictures to Mr. Barfoot. Did you see them?